This is a ridiculously tasty (yet super easy!) 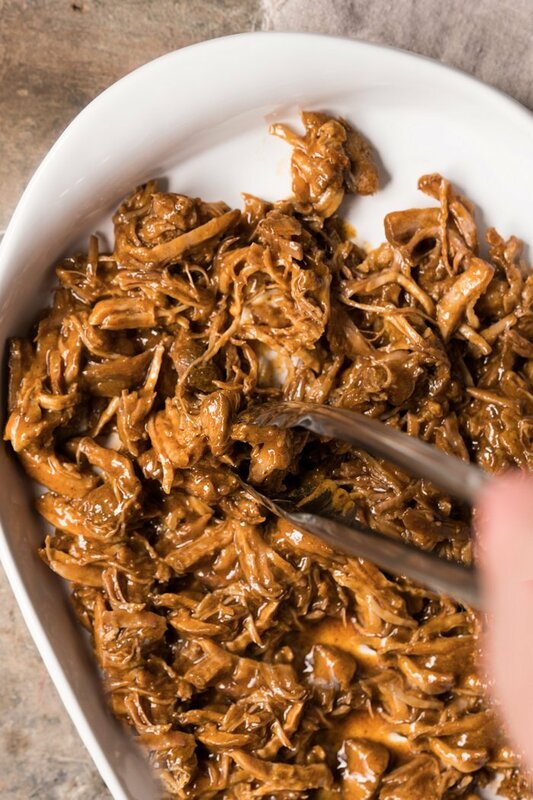 paleo and keto bbq pulled pork! Whip it up quickly in your instant pot (or slow cooker!) for the ultimate low carb weeknight meal. You do gotta love the instant pot (or pressure cooker) for speeding up the cooking process, by a lot! So think of this as your lazy (and weeknight friendly!) bbq pulled pork. 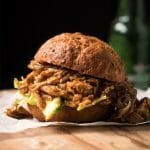 Truly ideal for the ultimate keto pulled pork sandwich! And if you haven’t got an instant pot yet (we got ours for Christmas and have fallen head over heels in love! ), you can also use your slow cooker. Just omit the water and cook on low for 6 hours. 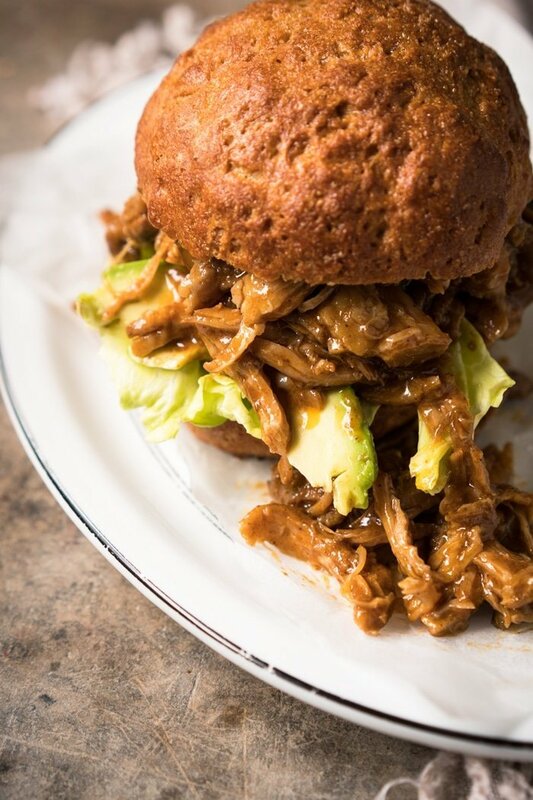 And while you can totally serve it up over a bed of cauli rice or do lettuce wraps, the ultimate companion for this keto pulled pork is undoubtedly our pillowy-soft burger buns! Mix vinegar, olive oil, paprika, oregano, garlic, black pepper, cumin, chipotle, cayenne and water in a small bowl. Season with salt and sweetener to taste, set aside (this will become you 'bbq sauce'!). Pat meat dry and cut into large cubes. Season with salt and freshly ground pepper. Set aside. Add in the bbq sauce mix and squeeze the orange into the mix before adding it in (yes, you want the whole orange in the mix!). Toss to combine. Lock lid in place, close pressure valve and press Meat. Adjust cooking time for 30 minutes and cook. Allow pressure to release naturally (roughly 20 minutes). Remove lid, remove the meat and sieve the juice into a saucepan (this will be your bbq glaze!). Heat up the bbq sauce until it just begins to simmer. Shred meat with two forks in the meantime and set aside. Make a glaze by dissolving the arrowroot or konjac powder in a couple tablespoons of water. Whisk the slurry into the sauce. Continue to simmer, whisking constantly to avoid lumps, just until desired consistency is reached (arrowroot breaks down in prolonged heat). Feel free to thin out with more water as needed, or thicken with more arrowroot (keeping in mind that your sauce will continue to thicken while cooling). 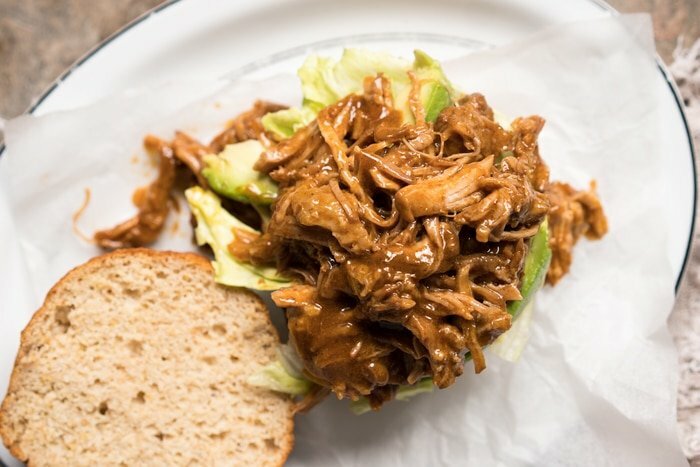 Mix the pork with the glaze and serve right away with toppings of choice (our keto buns, cole slaw... or even avocado and ice berg lettuce!). If you haven’t got an instant pot yet (we got ours for Christmas and have fallen head over heels in love! ), you can also use your slow cooker. Just omit the water and cook on low for 6 hours. Please note that nutrition facts were estimated for 1/4 of the batch of the keto bbq pulled pork! 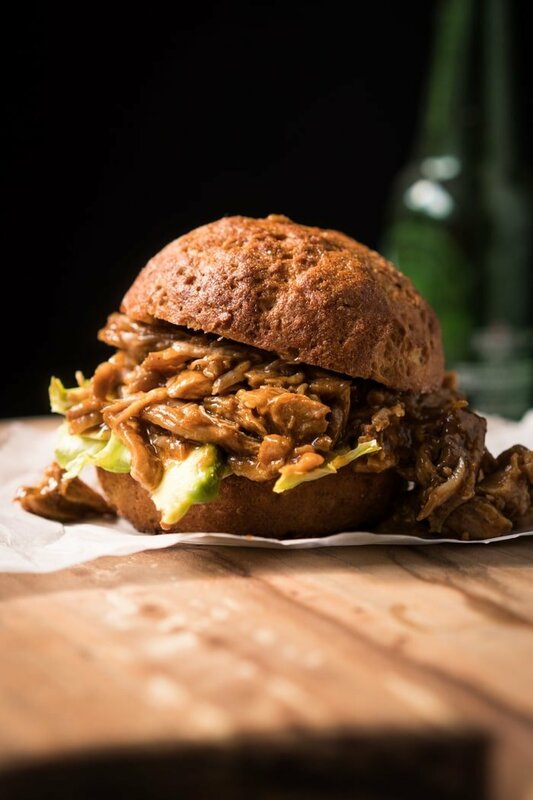 If making a pulled pork sandwich with our burger buns, add 3g net carbs (just 5g total!!). Ok new to this is the bbq sauce made from the ingredients above? What is the purpose of the arrowroot powder? 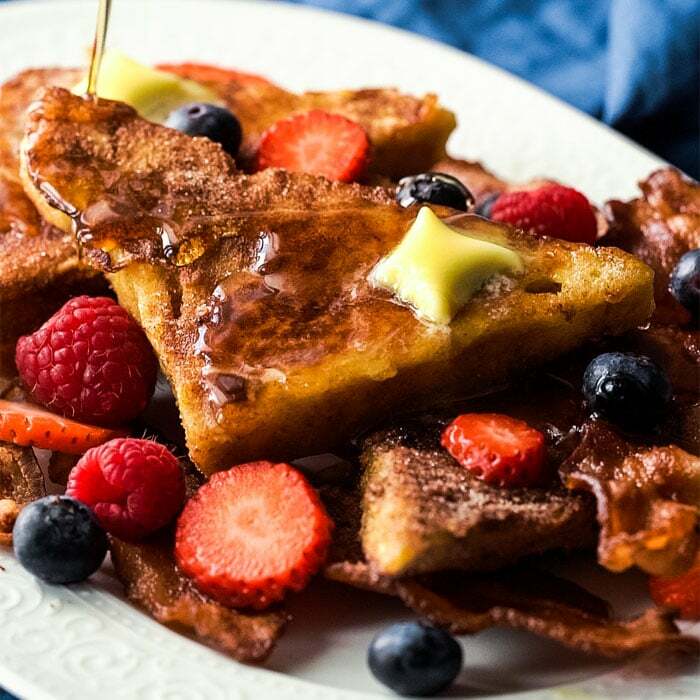 Can i omit or substitute with coconut flour? If I am crock potting this recipe, can I put everything in at the same time to include the baroque sauce part as well? Also, do I need to sear the pork prior to crock potting it. Trying to nail some recipes for game day, and this sounds perfect for sliders. Thanks! OH. MY. GOODNESS.!!! This totally ROCKS. I think what puts it over the edge with the flavor is the Chipotle Pepper. I had this with a keto bun, and with a lettuce wrap and sliced avocado on top. I think the next time I eat it, it will be straight from the pan! It is sooooo good! Thank you so much for all your hard work on these recipes, Paola! I am making this right now and I’m wondering if you add an additional cup of water along with the cup that you use in the sauce. You say to add the BBQ sauce mix, water and orange to the instant pot, but above you say to add the water to make the BBQ sauce. There is only one cup of water in the recipe. Am I missing something? I don’t want to add an additional cup of water unless I need it. Please let me know. Thank you. Hi Patty! Thanks for the heads up on this, so yeah water in the instructions was in there twice (fixed now!) xo!! This is my first time commenting, but I’ve been IN LOVE since discovering your site several months ago! 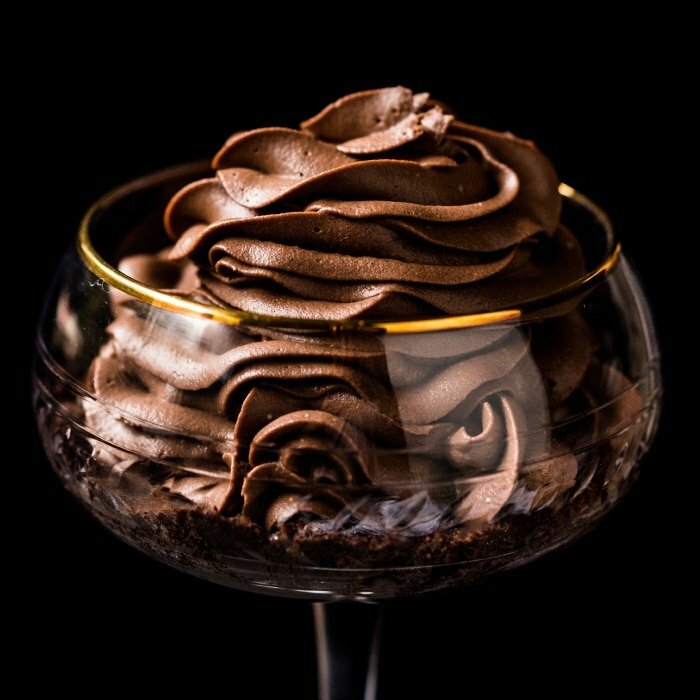 Every recipe I’ve tried has been a hit! Tortillas, brownies, cinnamon rolls…..Your bread is a staple that I make every week! Heading to the store to look for chipotle powder. Any suggestions on subs if I can’t find it? Hi, I entered this recipe into my recipe database for easy add to my daily food log. The nutritional info. is quite different. 688 calories/serving. I have the 1 kg of pork shoulder (about 2 lbs.) at 2306 caloires. divided by 4 this is still a lot higher than your calorie count. Not sure why such a big discrepancy. It’s most likely that it’s counting sugar alcohols as regular carbs (it’s common practice to substrate them as you do fiber) xo! I made it. Could only get collar not shoulder. Didn’t have an Instant cooker just a regular pot with a lid. Would have taken ages to shred it so I minced it. Also, buns weren’t fluffy enough. And also couldn’t get chipotle powder. Hi Ryan! I’m sorry this one didn’t work out for you! Unfortunately by mincing the meat, and not letting it cook to ‘shred’ you didn’t get the proper intended results of the recipe 🙁 So you would either make it in an instant pot, slow cooker or do a 6-8 hour gentle simmer to get that melt-in-your mouth result. You get A LOT of flavor from not taking short-cuts in cooking (the unfortunate reality!). Otherwise I agree, sounds like with the route you took it would just be an OK dish. And regarding the buns, you probably need a bit more heat (or a little longer proof). xo! And I wasn’t blaming you or the recipe. Tell telling you the result. Ryan I wasn’t being condescending at all! I’m sorry it came across that way 🙁 and thank you for always being truthful in your reviews, I was just trying to give you a pointer on why you may’ve not gotten the best results out of the recipe. Unfortunately this type of recipe is meant to be ‘slow cooked’ (which the instant pot does a wonderful way at speeding up!). And the flavor builds up on how you cook it. There are some recipes where by taking a shortcut you’ll sacrifice taste, that’s all I meant to say. Again, I’m sorry it came across that way Ryan! xo! 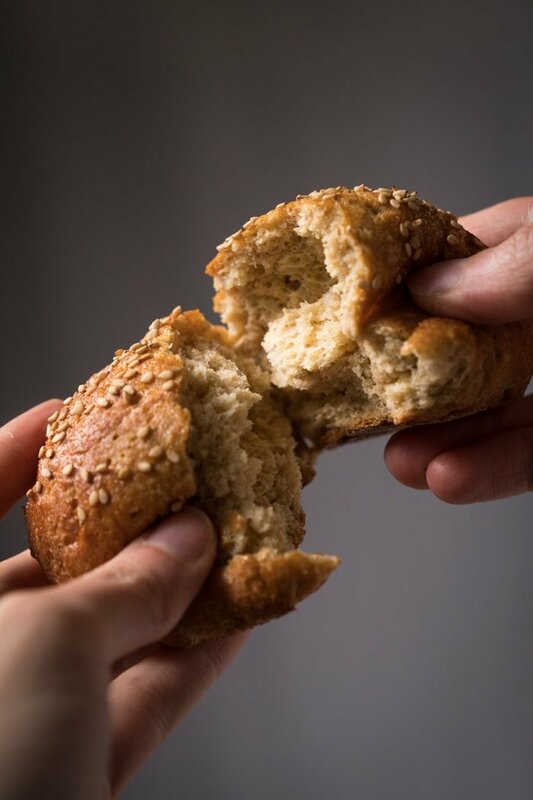 I’d like to try this recipe… but I’d make some subs: could you please tell me if they would be fine to get a decent result, considering that I do not pretend it would be exactly the same as the original recipe would give (but it would be great for me if I could adapt this to my limits and needs)? So: apple cider vinegar instead of wine vinegar; about the organge: I’d omitt it (do not have her- it’s no season for them in my Country now, and I do not like oranges anyway)… I do not eat fruit except lemon juice… if absolutely needed for the recipe, could I eventually use lemon instead of orange? Or other suggestion about this? It looks mouthwatering… silly question: could I use apple cider vinegar instead of wine vinegar? And about the orange: I don’t have oranges (it’s not their season here), and I neither like them: could I omit the fruit? The only kind of fruit I use is lemon, would it be eventually acceptable as sub? Hi Roberta! Yeah no prob, just omit the orange! Nutrition values are for the arrowroot, so they would be a bit less with the xanthan gum (which keep in mind can get a bit slimy). The one thing is that I wouldn’t use apple cider vinegar, it’s quite different and I don’t see it working out 100% xo! I’m fairly certain I always eye drool when I visit gnom gnom! Sounds awesome! Do you think we could sub in a beef roast for the pork? Maybe add a little butter?